Pacific Panels Inc. has manufactured aluminum honeycomb panels in Oakland, CA since 1994. Our team has over 40 years of combined expertise and has worked with a wide variety of industries. 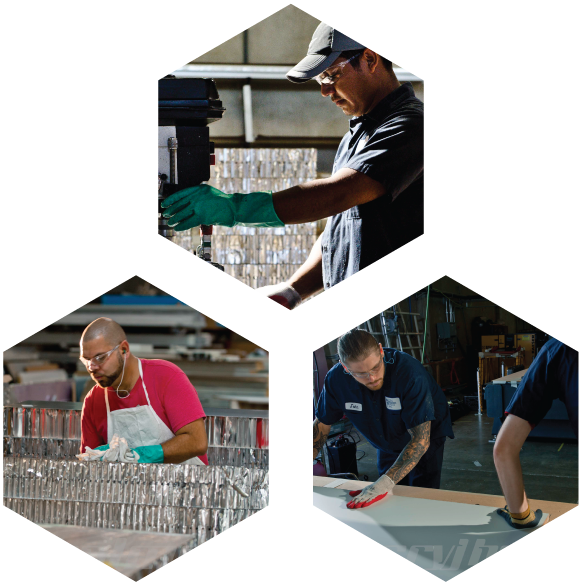 Our values are simple: We work with you to provide the highest quality aluminum honeycomb panel solutions, and we deliver exceptional customer service along the way. We understand that your success is ours, and we work tirelessly to ensure you are 100% satisfied with your order. Our technical team has years of industry experience and unique hands-on knowledge of aluminum honeycomb panels. Our 20,000+ sq ft facility is equipped to handle even the most complicated and intricate of custom panel requests. We work with you to create custom solutions for your exact needs. Pacific Panels is a leader in lightweight and high-strength products. We are positioned to be at the center of innovative solutions to complex challenges in the production and design world. We have provided successful solutions to numerous industries world-wide from high-end engineering to high-end retail. Learn more about Aluminum Honeycomb Composite Panels, and explore if they are the right solution for you. Tell us more about your project, and our technical team will work with you to explore what’s possible with aluminum honeycomb panels as a solution.